Now I have been to this lovely Italian Restaurant a few years ago with a friend from Denmark and my family and it was lovely… so I have decided to pay it a visit again. The chef is from the Piedmont region in Northern Italy and he brings a refreshing touch to both traditional Italian dishes and some specialities from Northern Italy. The restaurant itself is absolutely stunning…. beautiful cream chairs, a modern Italian feel all around… a bit like the wedding cake statue in Rome. Efficient service with a smile and warm Italian hospitality. Now this place is so reminiscent of my trip to Venice last year! If you’d like to check it out here is the Venice Page. I opt for the Modo Mio Cocktail to kick things off…. Vodka, Campari, Aperol and San Pellegrino Aranciata Rossa. The nice bitter strength of the Campari with the soft offset of the Aperol is lovely. To accompany my meal, I choose the Monte Antico IGT Sangiovese (2009) from Tuscany which is full of fruit flavours with minimal tannin bite. It just flows through the tongue which is the perfect way to end a relaxing long weekend. 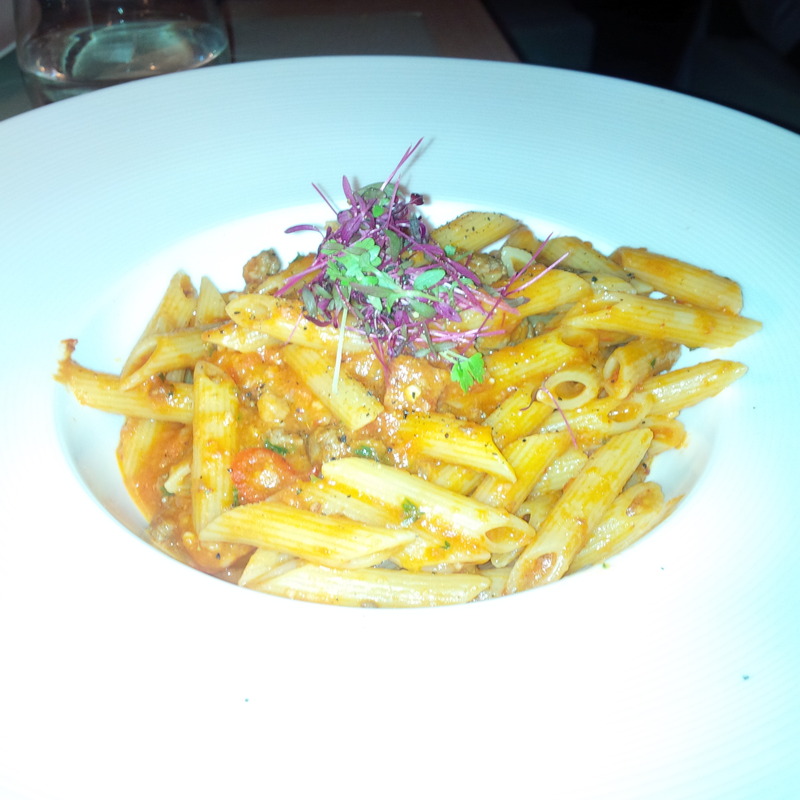 As the name Cipriani suggest this dish originated at Harry’s Bar in Venice. (If you wish, you can check out my review of Harry’s here). The tender oily raw beef slices are full of flavour, while the parmesan cheese adds rich creamy texture and tart hint to the dish. The drizzling of the Cipriani sauce ( A traditional tomato & cream sauces with a touch of parmesan) provides a nice extra touch to the dish without detracting from the beef. Now these are garlic prawns with a difference. The lovely chilli, garlic prawn are mixed with a creamy sauce. The cream provides a lightness to the dish and the chilli does shine but doesn’t overpower the succulent prawns. It’s such a lovely dish. Once you’ve had the prawns, you scoop the rest of sauce and lather it on the lovely semi-dried tomato and bread crouton which is drizzled with a generous helping of olive oil to create full flavoured taste sensation. It’s rich, it’s creamy, it’s crunchy, it’s got the tang of the tomato, the flavoursome prawn juices and silkiness of the olive oil. It’s a masterpiece. The dish is actually well suited as an entree. The beautiful roast eggplant rolls are pierced to show a light creamy ricotta filling which is gently combined with some tangy tomatoes. Finally the tomato basil sauce and tartness from the cheese just round out the dish. This is my dish. 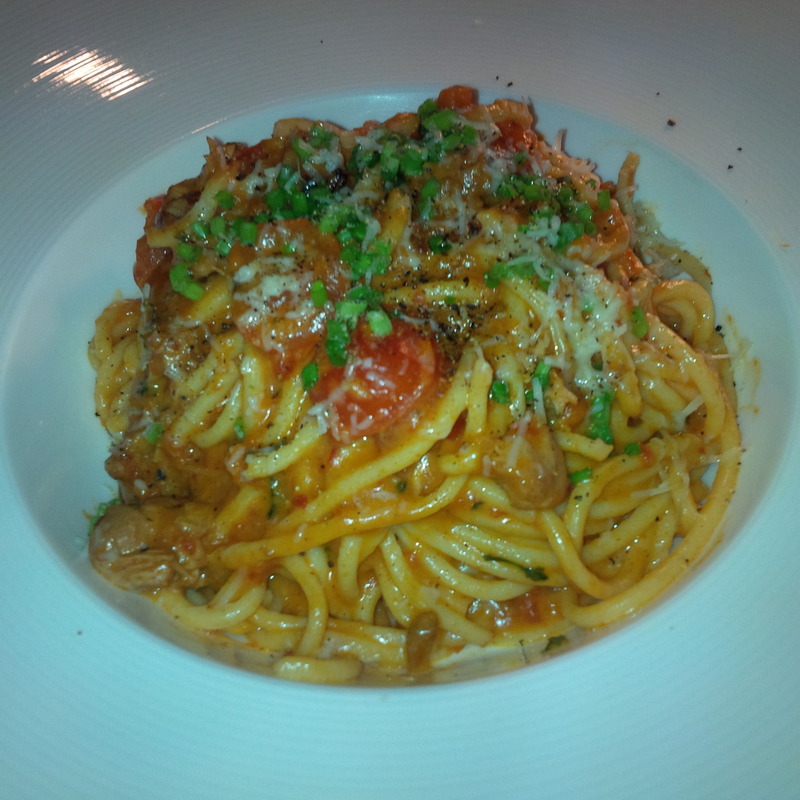 The thick rabbit stew is entwined in fresh ‘chitarra spaghetti’. The succulent rabbit meat is a stand-out in this dish. The textures of the rabbit, the stew and the soft pasta is amazing. The rosemary and juices from the rabbit shine through the white wine reduction sauce to really showcase a super star. Now Modo Mio – it’s got class, service, location, a touch of elegance and if you’re a day dreaming you may just think you’re back in Italy for a second.